For 2019, there were a few things I wanted to do differently. One was to shed some weight, and by that, I am referring to how much I carry with me. It was time to change bags and go with something a little lighter. With my previous bag, I wanted to carry as much as I could. I wanted the availability of my lenses for those instances where if I wanted them, I had them nearby. The reality was I rarely switched lenses and stuck with the first lens I attached to my camera body. There were several lenses I was carrying around that rarely got put to work. I could have just stayed with my regular camera bag but there would have been a lot of extra room in there, which tempted me to fill the bag back up. It was time for a new bag. I still use my Cecilia Black Leather Camera Strap and the craftsmanship has held up through several different shoots and adventures. Going with one of their camera bags was the obvious choice. I was able to get a hold of their new Tharp 8L in Black Leather. I like black and it matches my camera strap. The Tharp 8L is Cecilia's smaller camera messenger bag, which is available in black leather, chestnut leather, and charcoal cotton twill. If you are looking for a larger bag, you can check out their Lambert 12L which is very similar and able to carry a 13" laptop with your gear. Now it's time to focus on the Tharp 8L bag a bit along with its features. The messenger bag is designed to bit both mirrorless cameras and standard size DSLR cameras with space for additional lenses, accessories, or anything else you want to stuff it with. I do use a battery grip with my DSLR which still fits within the messenger bag, but it does end up taking up more room. I am able to fit my camera with grip vertically within the bag and room to move the padded dividers over to fit a lens. With this setup, I usually just stack my Canon 85 mm f/1.8 lens with the Canon 50mm f/1.4 lens where body caps are touching each other. This is my go-to portrait setup, and I usually stick with the 85mm. If these lenses were longer in length, they wouldn't fit together. I have opted to go without the battery grip and then I am able to bring along another lens. My other option is to go with the battery grip and my Canon 24-105 mm f/4 which fit perfectly in there. 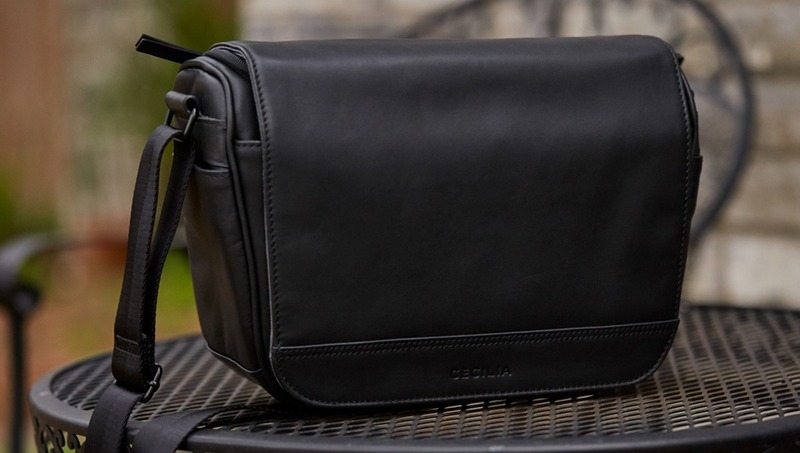 Cecilia Tharp 8L Camera Messenger Bag in black leather. One thing that I loved about the camera strap was Cecilia's attention to detail in the craftsmanship, and the messenger bag wasn't any fit. The build was solid. I feel very comfortable having my gear in the bag without having to worry if the strap will fail, or the stitching will come undone, or any other issues with the bag itself. 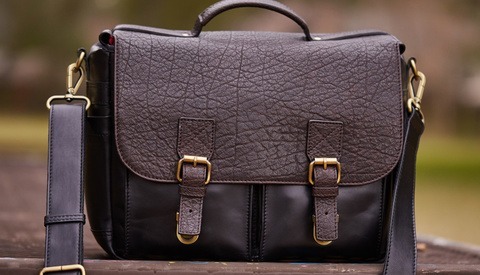 I did tug and stretch the bag around to see how well it held up, and I didn't see any compromises in the build even with its soft leather surface. Their quality is also something they stand behind, Cecilia states on their site they guarantee their products for life. Padded dividers with Velcro end for customizable compartment sizes. I loved the custom molded foam back with ventilation channels to allow airflow to flow between you and the bag, plus the extra comfort it added. The padded strap is great, comfort is everything when you have to carry it around for a while. There have been many times where I left my previous bag in the car simply because I didn't want to carry it. I didn't have that issue with this small, light-weight bag. The magnetic connection flaps work wonderfully. The flap features magnets in two sections of the flap, one at the end to close the entire bag and the other just above the main compartment. If you left the main compartment unzipped, when you open the flap the main compartment opened as well for extra convenience. This allowed for easy access to grab the other lens and swap them out. Once done shooting, zipped up the main compartment to keep your gear secure. 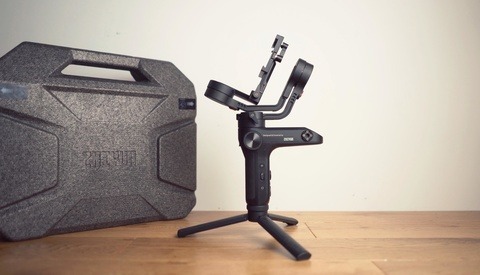 The Tharp 8L is also perfect to carry my DJI Mavic Pro Drone whenever I decide to take it out along with extra accessories including multiple batteries. While I really like the bag, there are a few things I wouldn't mind changing. I will have to say these requests are not limited to the Cecilia bags only and could be improved in several bags. The first one is regarding the padded dividers, which I wouldn't mind them being a little thicker. There hasn't been any issue with the current thickness of the padded dividers, but they always felt like they were on the slimmer size. Since I rarely use my camera out without the battery grip, I love shooting portrait orientation shots with the shutter button on the grip for improved comfort, it limits what else I can carry in the bag when I have it attached. I know that's a given and it's my preference to have it on but it seems like the majority of all camera bags are designed to fit cameras without battery grips. 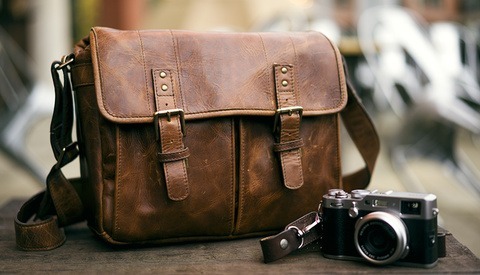 Even when looking at other bags, I rarely see their product photos showing a camera with a grip on it. This is just me being picky since the bad is designed for standard size DSLRs and the Tharp 8L camera messenger bag is a great choice. My old memory card booklet wasn't cutting anymore. I needed something else to carry my memory card in, with the camera strap and now the camera bag, Cecilia's SD Memory Card Wallet in matching black leather made perfect sense. The same great quality black leather was the perfect way for me to securely carry my memory cars within the camera bag front pocket along with a few other accessories. I didn't have to worry about the cards being loose or moving around. The wallet holds 9 SD memory cards along with 4 micro SD cards. The metal g-hook closure is easy enough to open without much difficulty yet secure to where it won't open on its own. the cards are fit snug in their pockets, my previous holder had all the memory cards loose in their respective slots. I like simple design on well-built quality products, and this fits the bill. Since I want to carry less gear and accessories when I don't need them, this is the great bag for me. Room for my camera and favorite lens with a few accessories plus comfort and usability of opening the main compartment easily to switch lenses. I like black, but if that's not your thing, I recommend checking out the other available colors online at Cecilia. I use pelican, strong! this looks like purse! It's nice to have a selection of bags that don't look like they were designed for SWAT teams. This one fits that bill nicely, I'm sure many will enjoy the more timeless style. This is the most "Ivan" comment ever.